Since I began my egg freezing journey, I've been mildly obsessed with hearing stories of other women who've frozen their eggs. I'm specifically interested in hearing the reason(s) these women chose egg freezing, how they felt sharing their decision with friends and family AND of course, how they coped with tons of hormones coursing through their veins. 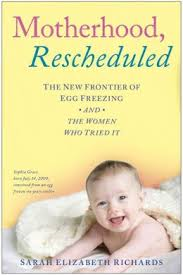 Reading Sarah Elizabeth Richards' book, Motherhood Rescheduled: The New Frontier of Egg Freezing and the Women Who Tried It, was like hitting the Adventures in Egg Freezing jackpot! I devoured the stories of the four clock tickers - Sarah, Monica, Kelly and Hannah in three days. I mourned, celebrated and was moved by each personal tale. And yes, I might have cried a few times too. Egg freezing is a proactive choice. It doesn't mean you've failed. As Sarah so eloquently wrote, "Egg freezing isn't and act of desperation or indulgence. Rather it's an act of love for her future family." Women need to be educated on their fertility while they have time to preserve it. If we can adjust from teaching young women pregnancy prevention and educate them about their fertility as a whole, the ticking clock will become less of an issue. There is power in sharing your story. The women of Motherhood Rescheduled are vulnerable and authentic. They're a wonderful example of courage. I'm in awe of their fearlessness and incredibly grateful Sarah's book allowed me to tag along on the journey. Seriously, check out the book. It's totally worth a read! Come back and share your thoughts in the comments section below.